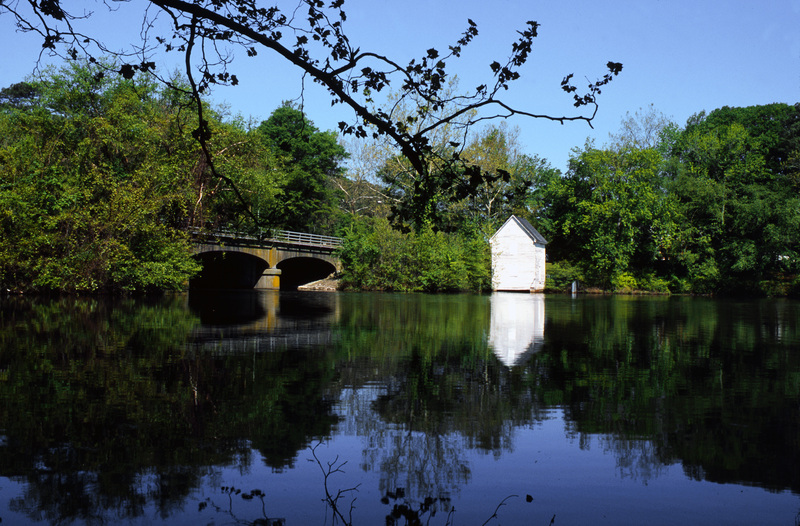 The Mariners’ Museum Park is 550 acres of privately maintained, naturally wooded property that offers visitors a quiet and serene place to walk, run, or picnic. 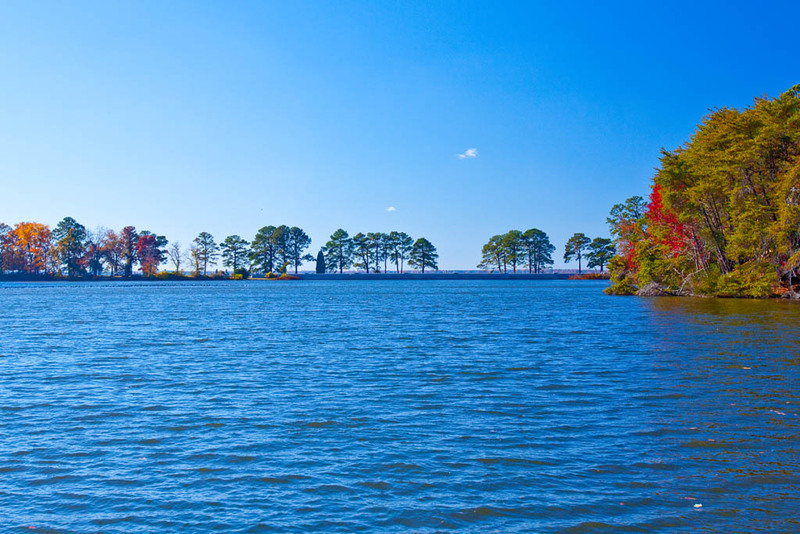 Within the Park is the 167-acre Lake Maury, named for the famed 19th-century oceanographer and native Virginian, Matthew Fontaine Maury. 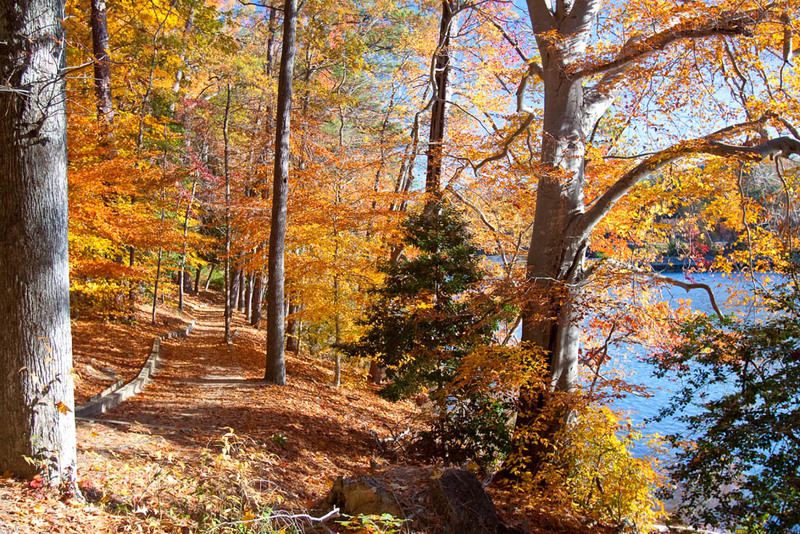 Following the shoreline of Lake Maury is the five-mile Noland Trail. Dedicated as a gift from the Noland Family in 1991 and with significant ongoing financial support from the Noland Family, the trail has fourteen bridges, picnic areas, benches, handicap access, and mile markers. Each fall The Mariners’ Museum hosts a Park celebration that includes the Noland Trail Marathon and Relay and a family-friendly fall festival. The famous Lions Bridge, a dam that provides a breathtaking view of the James River, remains a highlight for visitors—a perfect family gathering place to enjoy the Museum Park. The beauty of the dam is enhanced by several fine pieces of statuary designed by Anna Hyatt Huntington, sculptor and wife of Museum founder Archer Milton Huntington. Four stone lions were mounted on the ends of the parapets of the dam in October 1932. 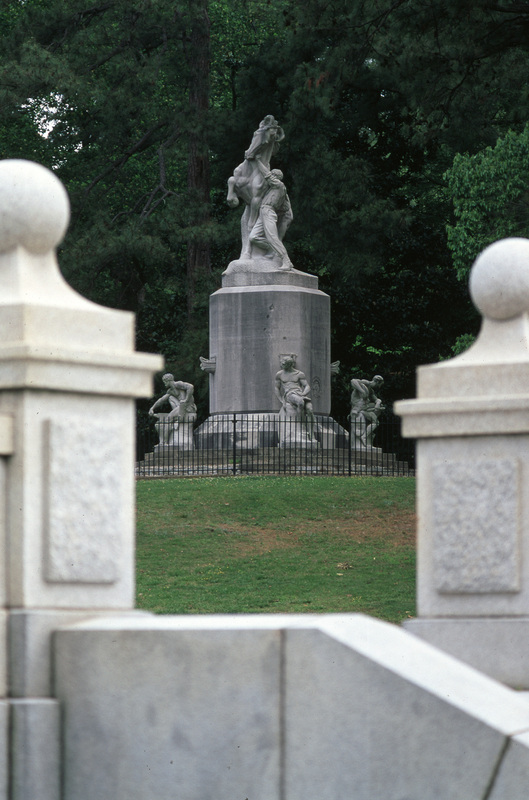 Anna also created and dedicated a monument entitled Conquering the Wild that overlooks the Lions Bridge, the park, and Lake Maury. you would like to see in the Park! Help Support The Mariners’ Museum Park & Noland Trail! What goes into keeping 550-acres of park and lake open for the public? A lot of hard work. Five miles of trail and bridges must be kept clear of debris and maintained for thousands of walkers and runners who use the Noland Trail each year, despite generous support of the Noland Foundation and family. The Museum grounds crew works year-round to cultivate the extensive native flora and to make sure benches, mile markers, and handicap access are available for park patrons. We need your help in preserving this community treasure. Created in 1930 by Museum founder Archer Huntington, The Mariners’ Museum Park is the largest privately maintained park open to the public for free in America. Highlights include Lake Maury, named for Virginia’s own Matthew Fontaine Maury, the famed 19th century oceanographer. 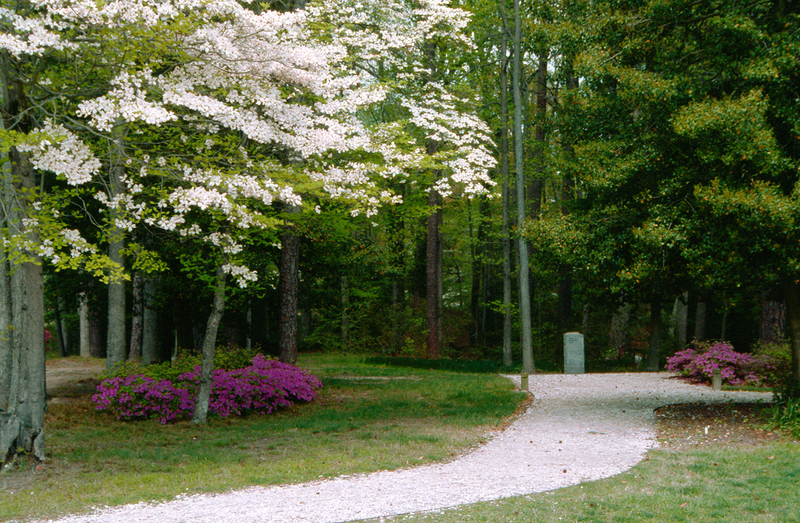 In 1990, Lloyd U. Noland, Jr., approached the Museum with the offer to finance the creation of a walking trail in the Park. Since the Trail’s dedication in 1991, the Noland Family has provided significant support for its maintenance and repair. 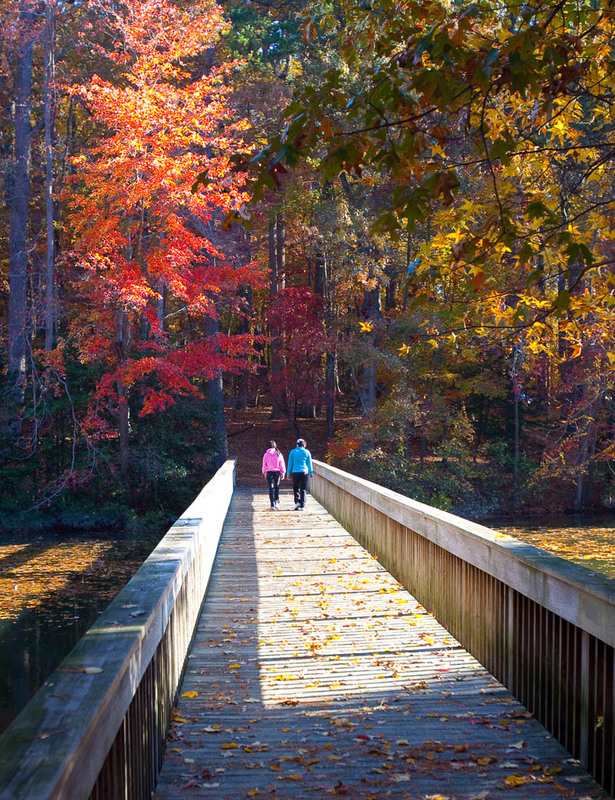 The five-mile Trail, a popular walking and running destination, features fourteen wooden footbridges. The famed Lions Bridge is another stunning Park landmark, noted for its four lion statues created by the Museum founder’s wife, Anna Hyatt Huntington. With significant ongoing financial support from the Noland Family, the Noland Trail provides walkers and runners alike with a five-mile path through this urban oasis. Join our partners, the Noland Family, in supporting this natural gift to the community by becoming a Friend of the Park. Support your favorite Park today! Museum Maintenance and Protection Services staff members are in the park at various times. Feel free to seek them out if you have questions or need assistance. The following rules were established to protect both the lake and park environments, and to help keep our pleasant, family atmosphere. While the Museum improves the boating and fishing opportunities for Park guests, boating and fishing are currently restricted. 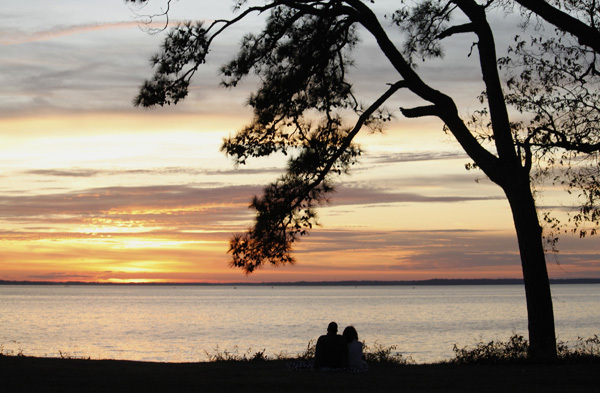 Wellness and Special Events (includes boating, fishing, the Noland Trail, and outdoor events). The health and sustainability of this important natural resource is our top priority. At this time, we are concerned about the quality of our water. We’ve taken many steps to understand the health of the lake including having master naturalists test the water quality. You may have even seen them out on kayaks in recent months! Many factors play into the health of the lake including the current construction happening on Warwick Boulevard, which requires dropping the water level to a shallow depth that limits water activity. We are striving to be as environmentally responsible as possible and ask for your patience while we strategically craft our plan to have sustainable fishing and boating on Lake Maury. We want nothing more than to open our waters to the community. We will get there. It will just take some time and we appreciate your patience with us as we work through it. You will see more frequent updates from us going forward. 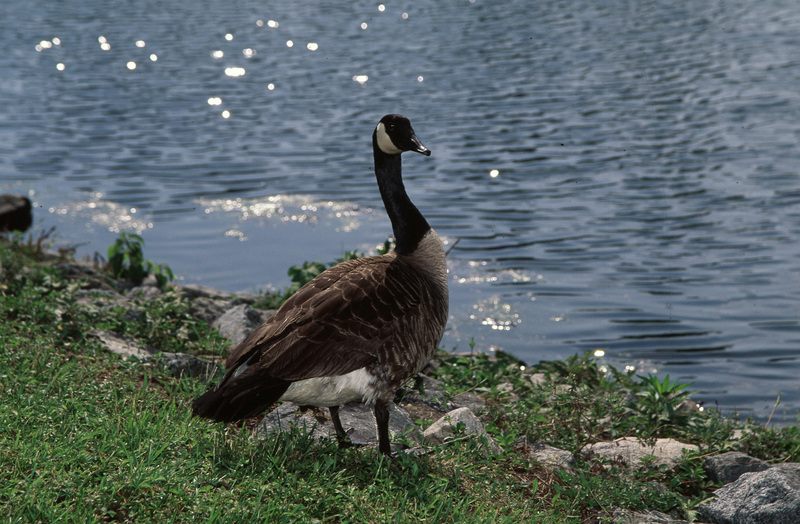 Those updates will include status updates on our progress towards reopening water activities on Lake Maury. You can also expect to see more opportunities from us to weigh in with your thoughts and opinions, and to volunteer with us in the forest and on the Noland Trail to restore and maintain sections of each. This Park is not just our Park, we view it as your Park, too. We take great pride in maintaining this shared resource. While the Museum improves the boating and fishing opportunities for Park guests, fishing on Lake Maury is currently restricted. The Mariners’ Museum Park is the largest privately maintained park open to the public for free in America. 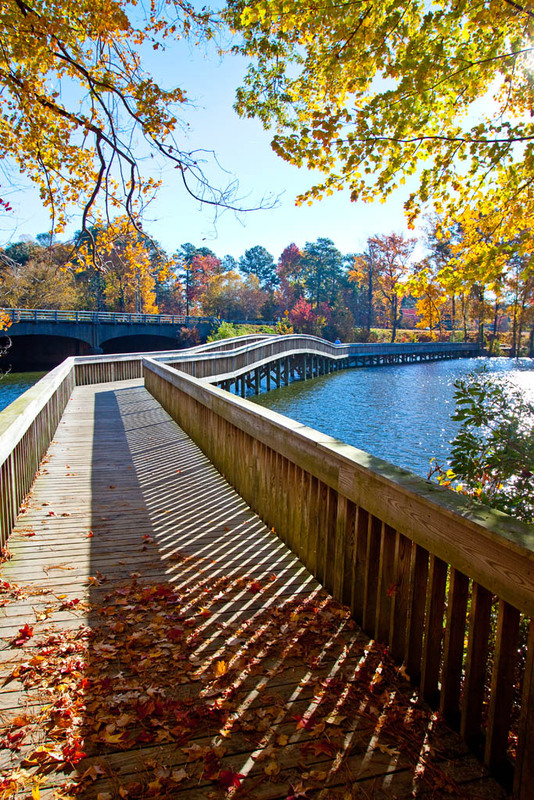 The Park boasts 550-acres of naturally wooded areas and the 167-acre Lake Maury bordered by the five-mile Noland Trail, as well as breathtaking views of the James River and the stunning Lions Bridge featuring the sculptures of Anna Hyatt Huntington. Selected areas of the Park are available for special event rentals. Each area has its own unique views, access to the Noland Trail, and event capacity. Picture your wedding along the James River, with views of boats going by, Lake Maury over your shoulder, and a wooded area nearby. Our park offers a variety of spaces to accommodate groups. 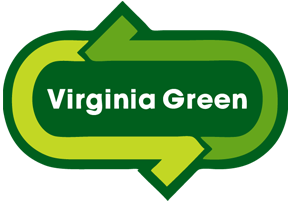 Our park is festival friendly due to our great location in Newport News, our ability to work with a variety of groups, our available wide open field spaces, and our flexibility in scheduling. Our park accommodates picnics of any size. You may choose one of our overlooks of Lake Maury for a more scenic, intimate feel or use our fields to accommodate a few hundred guests. 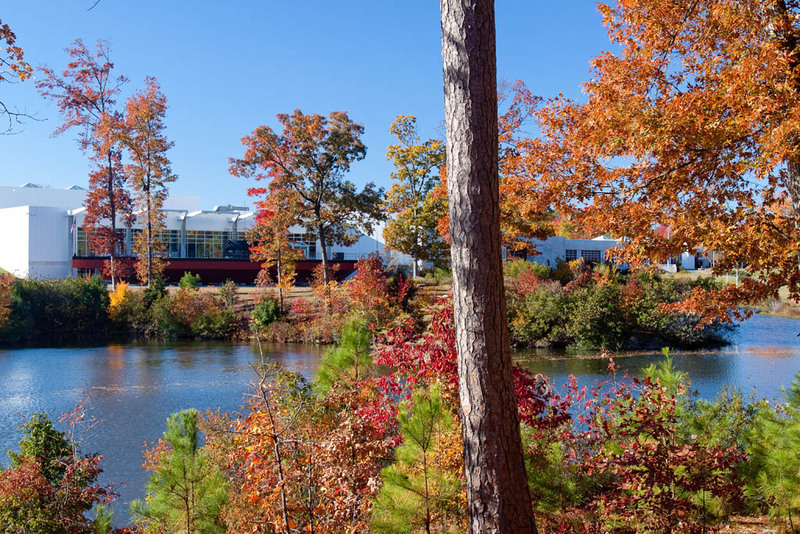 A variety of races in Newport News call the Museum their home for their 5K, 8K, & 10K races. Our convenient location and park layout provides many scenic routes and ample space. Discover more information on all our park rentals. at The Mariners’ Museum Park! The longleaf pine is the rarest of nine native pine tree species found in Virginia. Timber from once-vast longleaf forests literally built colonial Virginia and the Peninsula’s shipbuilding industry. Today, longleaf pines only cover three percent of their historical range. 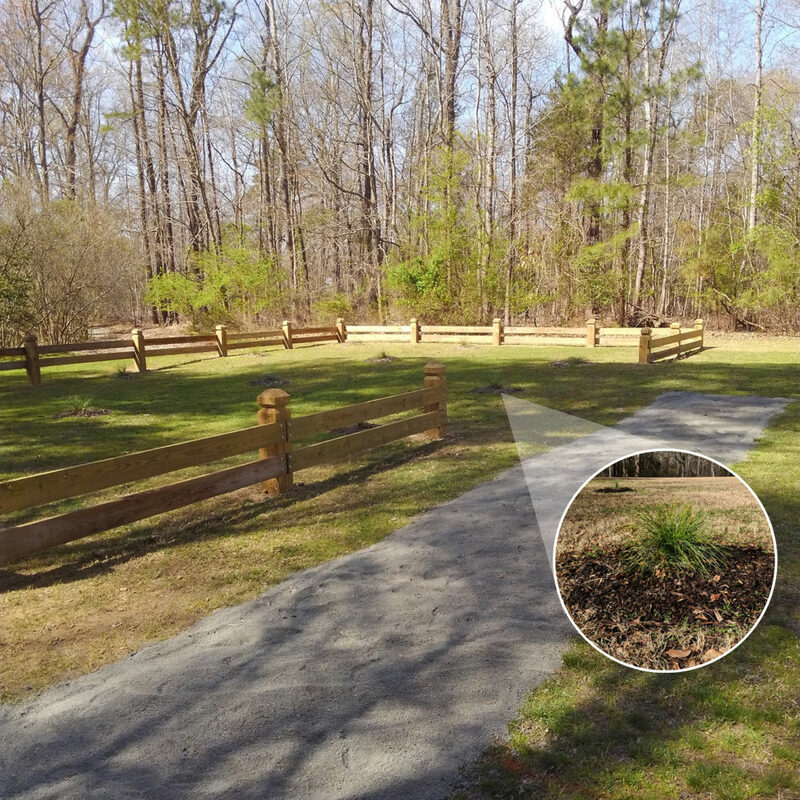 The Mariners’ Museum and Park partnered with Newport News Shipbuilding and The Nature Conservancy to plant a longleaf pine grove in The Mariners’ Museum Park this spring to help in the restoration of the tree species. Each tree also commemorates a ship commissioned at the shipyard and honors our shipbuilding heritage. The most valuable tree to the naval stores industry was the longleaf pine. “The Turpentine Industry — North Carolina,” artist Harry Fenn, Harper’s Weekly (New York, NY), April 9, 1887. Courtesy of the State Archives of North Carolina. Like holding an acorn and envisioning a mighty oak, looking at a longleaf pine cone begs for some imagination. Even as a seedling, a longleaf is remarkably ordinary, resembling an unruly clump of grass as much as a stately tree in the making. Beneath the surface, however, that seedling grows one of nature’s most remarkable root systems. During its early years, a young longleaf sends down a deep tap root to connect to water. In a broader sense, the story of longleaf pine connects us all as Virginians and Americans to our shared maritime history and our first steps on American soil. To grasp the significance of America’s once-vast longleaf forests to the European explorers who first set eyes upon them, one must first understand the historical connections between pine trees and seafaring cultures. From the moment people first embarked upon the seas, they depended on a range of products—known collectively as naval stores—derived from pines. Naval stores that were essential for building wooden vessels and keeping them seaworthy included pitch, tar, turpentine and rosin—all produced from sticky, resinous pine sap. Other commodities, such as masts and planking, required harvesting and milling entire trees. As the term naval stores implies, a primary consumer of these products was the world’s navies. Because tar and pitch, in particular, were critical for building and maintaining fleets of wooden sailing ships, power on the high seas was utterly dependent on a reliable supply of naval stores. The failed Lost Colony of Roanoke, however, meant that more than two decades would pass—at least according to the surviving historical record—before England was able to experiment with producing naval stores from longleaf pines in America. In October 1608, Captain Christopher Newport sailed the Mary Margaret on his return trip to Jamestown. Dubbed the Second Supply, Newport’s voyage replenished the settlement’s provisions and introduced 70 new immigrants, including eight “glasse-men” of German or Polish origins. Little is known about these skilled workers beyond that their ranks included not only glass makers, but also men with experience producing naval stores. Nevertheless, the naval stores industry had arrived on America’s shores. As the Jamestown settlers struggled to survive, squeezing out their few dozen barrels of pitch and tar from the sparse stands of surrounding pines, little did they know what lay directly across the mighty James River. South from the James to what is now the North Carolina state line stretched at least a million acres of longleaf—the most highly resinous pine tree on Earth. And Virginia was only the northernmost tip of seemingly inexhaustible forests reaching from the shore to the Piedmont and wrapping the Atlantic and Gulf coasts all the way to Texas. At that time, British naval power and maritime commerce relied on imports from Prussia, the world’s largest producer of naval stores. 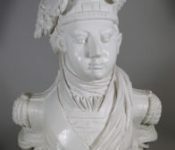 By the middle of the 17th century, Sweden had overtaken Prussia and would soon dominate the world market, as the label “Stockholm Tar” became synonymous with the highest quality. But England’s supply chain was severed at the turn of the 18th century, as Russia and Sweden were engaged in the Great Northern War. The American colonies generally were content making enough naval stores for their own needs, so the British parliament passed the 1705 Bounty Act, the first of several incentives intended to boost production. The act established a 5-10-shilling bounty for every barrel the colonies exported to England. So how exactly were naval stores used? At every stage in the life of a wooden vessel. “In the bustling shipyards of long ago, barrels of tar and pitch were everywhere,” writes Earley. And proximity to forests of longleaf pine, along with a warm-water port, helped determine the location of colonial shipyards, including the Navy’s oldest facility, which opened on the Elizabeth River in 1767. Tar was the most basic product, made by slowly burning pine wood in a kiln—a process comparable to smelting or slow-roasting. In a shipyard, caulkers hammered tarred hemp fibers called oakum into seams between planks for waterproofing. Outfitting a sailing ship required miles of rope and cordage, all of which were woven in a separate elongated building called the ropewalk. The first tar treatment would be applied “in the yarn” (i.e., to individual strands), finished ropes and cords received a tar coating to protect them from seawater and salt air, and rigging ropes got yet another slathering both to seal out water and to stiffen them for easier climbing. Rendered from boiling tar, pitch was used in the shipyard primarily to coat hulls. Pitch provided waterproofing and protection from wood-boring worms and mollusks. A third product, turpentine, was distilled from the gum of living pine trees into either rosin or spirits of turpentine. Both were used as ingredients in more than 100 other products, from soap to paint to gunpowder. 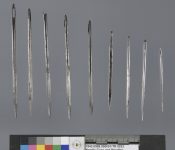 One particularly gruesome application took place during naval battles, when surgeons used hot turpentine to cauterize wounds and amputations. Finally, of course, wooden ships required a great deal of timber. For key hull structures, shipwrights preferred oak, though pine was the favored material for hull and deck planking, spars and masts. The largest wooden merchant ship ever built, the Great Republic, measured 335 feet long and consumed an astounding 1.5 million feet of “hard pine” (i.e., longleaf). Even with the arms race for ironclad ships underway, American shipbuilding—and, with it, the naval stores industry—enjoyed its heyday in the mid-1800s. But the ability to turn a profit from naval stores ended, at least temporarily, with the outbreak of the Civil War. Both sides still needed enough naval stores to maintain their vessels. And when the famous ironclads entered the fray, beneath their armor plating was still a tremendous amount of wood. “In Virginia, of Virginia iron and wood … was she built,” said Col. Charles Norris, describing the Confederate Merrimack (AKA Virginia). 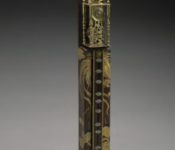 The Union Monitor’s four-inch plating was attached to a two-foot-thick sloped casement constructed of oak and longleaf pine, the timbers bolted together and caulked with tar-treated oakum. After the Civil War, international conflicts such as the Franco-Prussian War led to periodic spikes in demand for naval stores. The advent of the 20th century, however, saw the transition not only from wood to iron in shipbuilding, but also from whale oil and camphene—the latter made from turpentine—to petroleum-based fuels. 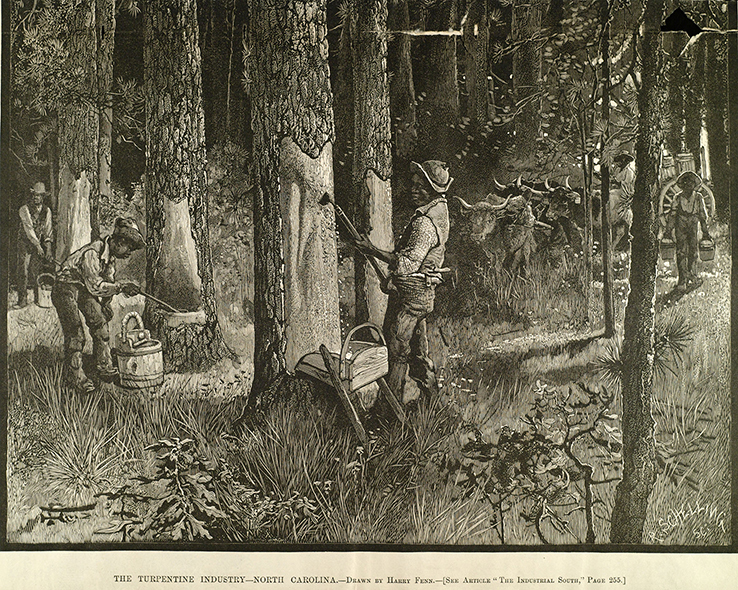 Turpentine production actually did not reach its peak until 1909, having shifted ever southward into Georgia, Florida and Alabama. 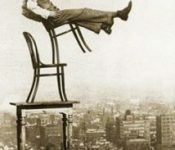 Even at its height, the industry was dying, and the dwindling market demand for naval stores was only part of the reason. First, the job was so dirty and dangerous—a single mistake or bad luck at the kiln could ignite a lethal explosion—that only workers with no better options engaged in it. Thus, the industry had exploited a labor force composed mostly of enslaved or impoverished black men. Moreover, “boxing,” the most common American method of tapping the pines for sap, mutilated and weakened otherwise hardy trees. Within four years, most boxed trees either died where they stood or succumbed to the wind. In 1893, forester B.E. Fernow declared that, in Virginia, “longleaf pine is, for all practical purposes, extinct.” By 1900, North Carolina’s longleaf systems also had been decimated and reduced to isolated pockets. And so it went, all along the coast. The march of the naval stores industry across the South, in ecological terms, left vastly more destruction in its wake than General Sherman. Today, we can only try to imagine the vastness of the majestic longleaf forests gracing our shores when Amadas, Barlowe, and Newport crossed the Atlantic. Yet the surviving remnants have inspired conservationists with the vision and resolve to bring back significant representative examples of America’s founding forest and the diversity of life it supports. Throughout the historic range of longleaf, a broad coalition of partner agencies and organizations is restoring thousands upon thousands of acres of longleaf forest. Returning longleaf to our landscape keeps open a window to our past and promises a healthier, biologically richer and more resilient coastal forest for future generations. The Mariners’ Museum and Park is a partner in these efforts in Virginia, having recently joined with Newport News Shipbuilding and The Nature Conservancy in planting a grove of longleaf seedlings on museum grounds. 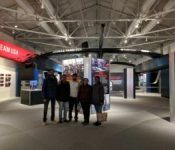 For our visitors, to see, feel or especially smell longleaf is an opportunity to connect with a time when these sensory experiences permeated American life on land and at sea.